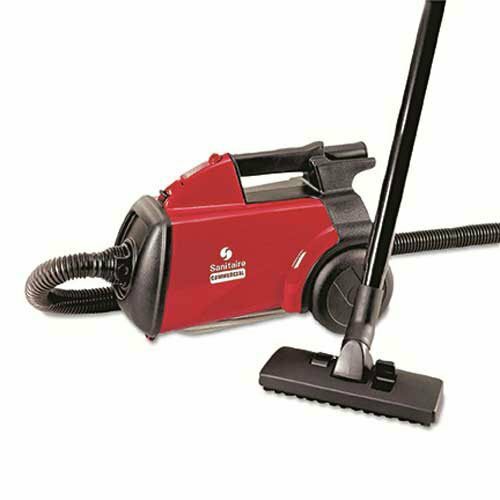 Sanitaire 10 Amp Mighty Mite Commercial Compact Canister Vacuum - Canister vacuum cleaner has a commercial-grade 12 amp motor. Tool kit includes hose, retractable metal wand, upholstery nozzle, crevice tool, deluxe dusting brush and deluxe floor tool. Includes shoulder strap and weighs only 10 lbs. Uses Eureka-type MM disposable paper bags. Canister vacuum includes 20L double-insulated power cord. UL approved. 1 Year Limited Warranty. Non-Returnable, Non-Cancelable Item.